Mix sugar, oil, vanilla and egg until creamy and light yellow. Add bananas and optional coconut and/or nuts. Add flour, baking powder, cinnamon and salt. Stir until completely smooth. 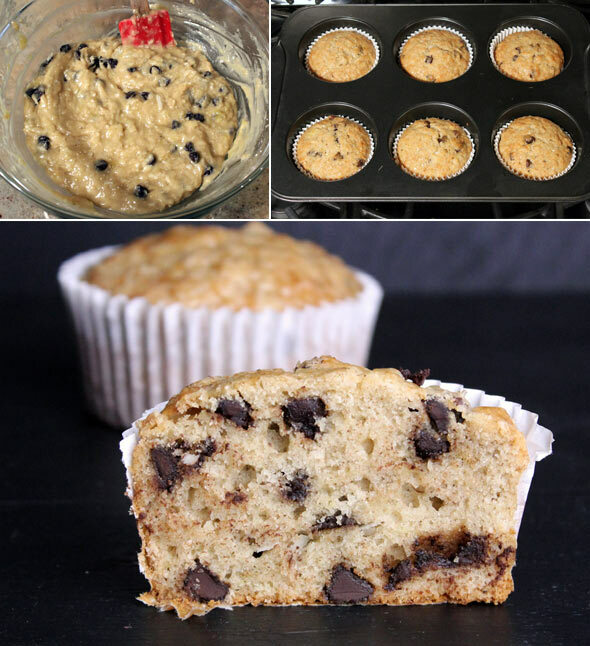 Fold in chocolate chips if using. Spoon the batter into the muffin tin. 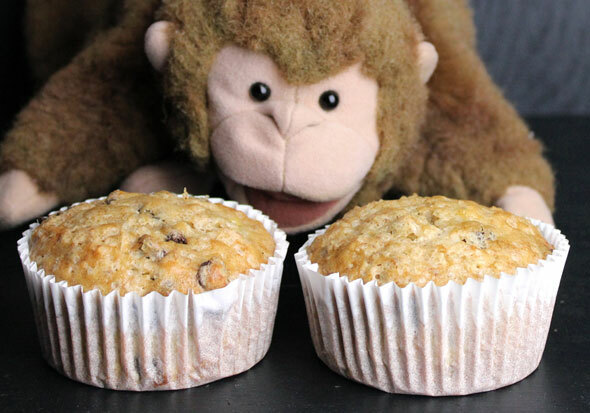 Since "2 or 3 bananas" is an imprecise measurement, I recommend testing the batter consistency before you fill the muffin cups. Dollop a scoop of batter into a bowl. It should roughly hold it shape, but easily jiggle down into a flat layer when the bowl is shaken. 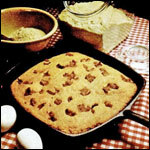 Add a few Tablespoons of milk to the batter if it's too thick or a couple Tablespoons of flour if it's too thin. I got lucky and 2 fairly large bananas didn't require milk or extra flour. For our muffin test, we made jumbo-sized muffins. They took 42 minutes to bake. 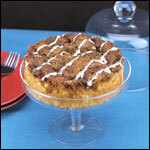 For the best flavor, use the optional shredded coconut, chopped walnuts and chocolate chips. Pecans work well too. 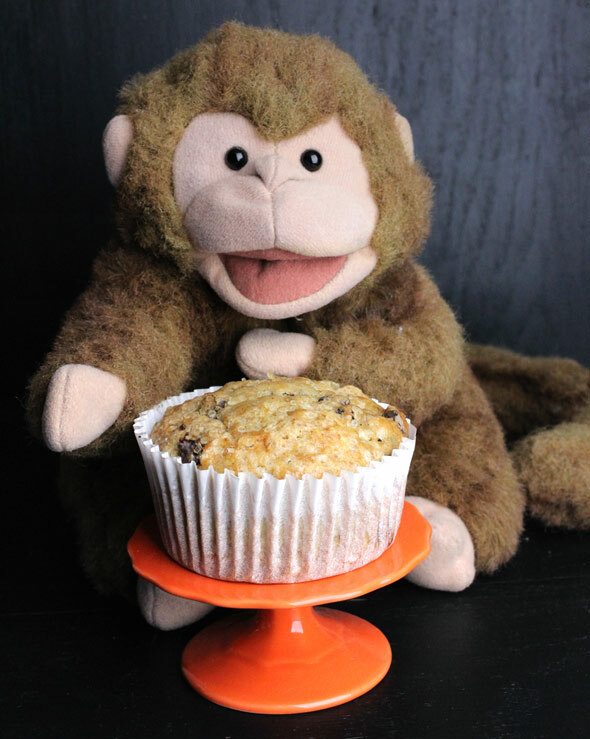 What do you think of Chocolate Coconut Banana Bread Muffins? 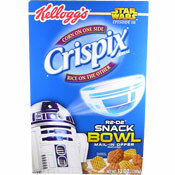 I add vanilla and a cup of chocolate chips. Everyone loves them! These are our family favorite. 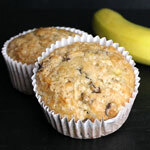 We make them whenever we have overripe bananas. We add dark chocolate mini chunks from Whole Foods and make mini-muffins. 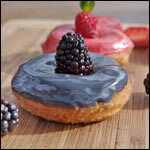 Especially awesome just out of the oven and a great quick treat! I decided to make these into mini muffins. I also added cinnamon to some tops and coconut flake to others. Left about half plain. They were good. Not the best I've ever had but definitely not the worst wither. Cooked for approx 15 mins each. These were great! I baked them for 24 minutes and added the 1/4 cup coconut. I agree that 30 minutes is a little too long - took mine out at 26 minutes and they were perfect. I liked that they weren't overly sweet. 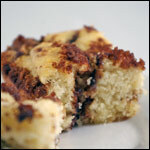 I added cinnamon in one batch and chocolate chips in another it added a great extra flavor to the bread. Not very sweet and watch them closely! 30 minutes is too long.